The Compulsive Reader: Cover Talk: Heads or Tails? Elizabeth Scott is the wonderfully prolific, charming, and dynamic author of many books, and one of my favorites is The Unwritten Rule (you can read my review here). It's the story of how Sarah falls for her best friend's boyfriend, and the chaos that ensues when she discovers that he feels the same way about her. I liked the original cover a lot because of the pretty purple background and how the feet almost symbolized their relationship--on the down low, tentative, fragile. 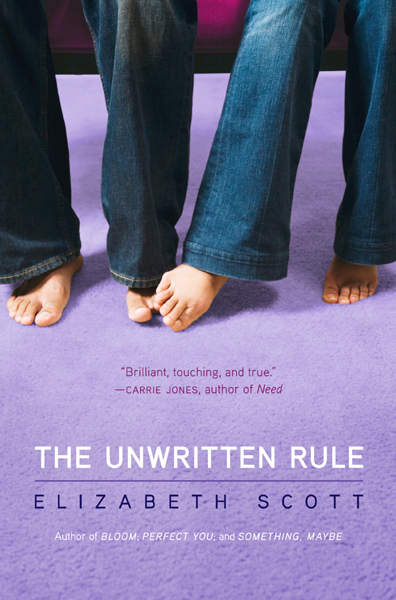 But for the paperback, The Unwritten Rule got a makeover, and the result is the exact opposite of the hardcover. What do you think? I really liked the hardcover, and was said to see it replaced, but the more I look at the paperback, the more I like it! The slate-y gray and the pop of red are just awesome! I think it stands out a little more than the other cover. What do you think? What's your favorite Elizabeth Scott book? Be sure to check out her two 2011 releases, Between Here and Forever and As I Wake ! I prefer the original, with the feet. If I were just browsing in a book store, I'd be much more likely to pick that one up. Well, the new cover is really pretty (with the popping red, as you said :)) but the old cover really conveys a sense of what the book is about that you don't get with the new one. I like the new one more cause that's the one I'll pick up when I'm in the bookstore! I definitely have to go with the original - it shows the books subject perfectly, and is more intriguing. The new one is definitely pretty, but there's a lot of covers that look kind of like it. Well, I don't like either covers very much, but I would have a hard time choosing between the two. I used to think the original matches the story line a little better, but the other one is like she is "falling" for him. I think both are pretty, but I sort of like the paperback a little more. I'm not a fan of photographic covers. I like ones which possess more pizazz. But, if I were to chose one it would be the "heads" one. Its just got more going on than the "feets" one. I like the look of both of the covers, however, the original definitely tells a story, whereas the new cover is just a picture of a pretty girl. Definitely doesn't tell me much. I haven't read the book, so I can't comment on which is more appropriate for the story, but since I don't really like feet, I really prefer the paperback! I also like Ozzy to surprise some people, but what I expect an eclectic gal. Hot obvious choice for this week. Mine is up at the cafe.